In the same way that people say they’ve had the flu, when really they’ve just had a bad cold, it really infuriates me when people who have a bad headache say they’ve had a migraine. Anyone who has ever actually had a migraine will know that it’s so much more of a headache, in fact, the headache is probably the easiest bit to cope with. 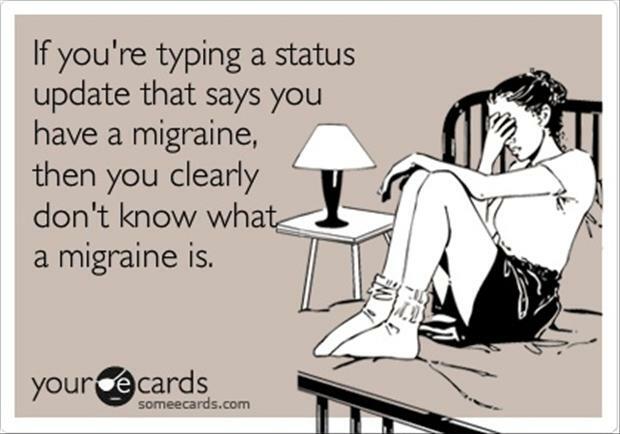 So be clear, the is a HUGE difference between and headache and a migraine. The first time I ever had a migraine I was about 12 and I honestly thought I was dying. I was happily lying in bed reading a book and all of a sudden I couldn’t see properly out of one of my eyes, similar to when you’ve just woken up and it takes you a few seconds to adjust to the light, only this was much worse, and, not really sure what was happening I went into sheer panic. Since then I’ve probably had about 2 a year and I’m still pretty much in the dark as to why it happens and what triggers it. Once the lights and other symptoms subside, am left with a pounding headache on the opposite side as other symptoms. But mainly I would put it down to stress and tiredness. Afterall I’ve never had a migraine whilst on holiday and i rarely get them on a weekend, which I think says a lot! So, as you can see, a migraine is much more than just a headache. What’s been troubling me recently, is that I watched a documentary the other night about a lady who suffered a similar attack (although on a much larger scale from what I can gather) and came round from it speaking in a Chinese accent (read the full story here http://www.dailymail.co.uk/femail/article-2408920/Sarah-Colwill-Plymouth-woman-woke-Chinese-accent.html). It worries me that the outcome of these attacks can obviously be very severe, even life changing, yet there doesn’t really seem to be much known about the causes of hemiplegic migraine, why it happens, what triggers it, and what can be done to prevent them. I just find it shocking that with all the medical knowledge there is, so many conditions these days are just brushed off as ‘just one of those things’ and that as long as you don’t have anything life threatening or something that’s clear what it is on diagnosis, you just get brushed aside and told to learn to live with it. I suppose I’m just thankful that it doesn’t happen more frequently and I really sympathise with those who get them daily. I just wish there was more knowledge on these horrible episodes that, is, what I imagine having a stroke feels like. Do you suffer from migraines? What pattern do they follow and what cures work for you? That photo made me laugh, so true! I used to get migraines quite frequently from late teens until I had my daughter (randomly, they stopped occuring after having her – don’t know what’s that about). Mine were always triggered by a glare of light – like catching the full brightness of the sun in my eyes, or staring into a lightbulb accidently. Then I’d lose half of my vision. I found the best thing to deal with them was to take paracetamol, ibruprofen and put myself to bed for the day to sleep off the awful headache that made me feel sick. I’d still wake up with the headache, but it was more bearable. They’re such a nuisance! You’re so right Rosie, if I’m in a car and the light is flickering through trees it can trigger them for me too, they are an absolute pain!